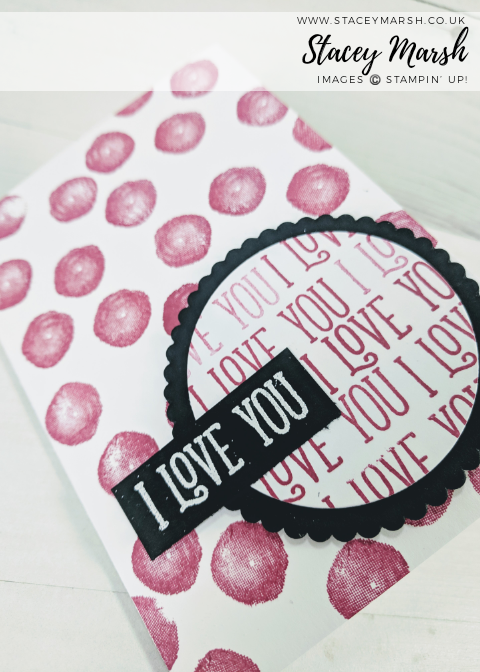 Today's card that I am sharing with you is one that I have given to my husband today to say "Happy Valentine's Day". I find it really difficult to hit the mark with male cards but i'm really pleased with how this one has turned out. I am a big fan of Emma Bridgewater china and I have taken inspiration from her with the dots and lettering for this one. 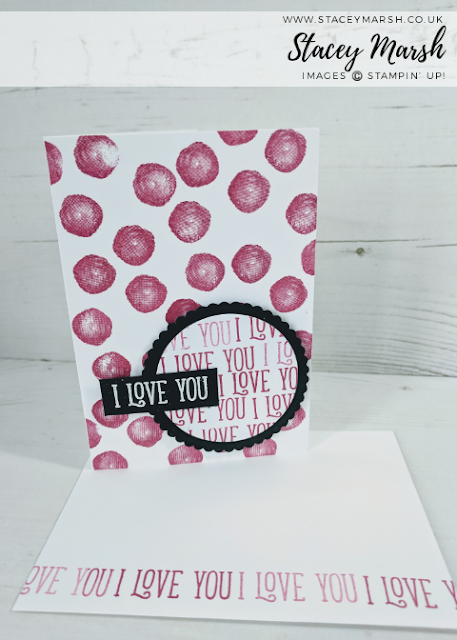 I have used the Whisper White Notecards and Envelopes for this project, and I have use the dot image from the Incredible Like You Stamp Set and stamped randomly in Lovely Lipstick Ink. I have cut the scalloped circle using the Layering Circles Framelits Dies from Basic Black Cardstock, and plain edged circle in Whisper White. 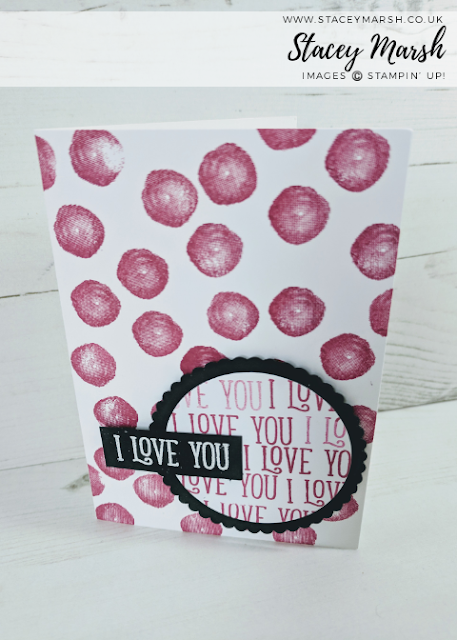 "I Love You" comes from the Happy Birthday Gorgeous Stamp Set and I have used 1st and 2nd generation stamping to create the tones of Lovely Lipstick. To finish, I have stamped the same sentiment onto Basic Black Cardstock using a Versamark Stampin' Pad, added White Stampin' Emboss Powder and used a Heat Tool to set. I have cut the sentiment down into a small strip and attached to the card front. As alsways, I can't bear to leave the envelope plan so I have again used 1st and 2nd generation stamping to create tones of the Lovely Lipstick colour. There is an AMAZING joining deal that is running through the to end of March!